Vermont Studio Center, and my February 2015 artist residency. This being my second fellowship at VSC, (the first was in May, 2011), I can say euphorically, that the place is magical. My work was transformed by environment, serendipity, conversation and accident. One of my current projects, (that manifested prior to attending the Center in 2011), is working with fictional plants, specifically, a very fictional ‘Ice Plant’. My practices are purely artistic, and inspired by acting the botanist on the stage of the Anthropocene Theatre. 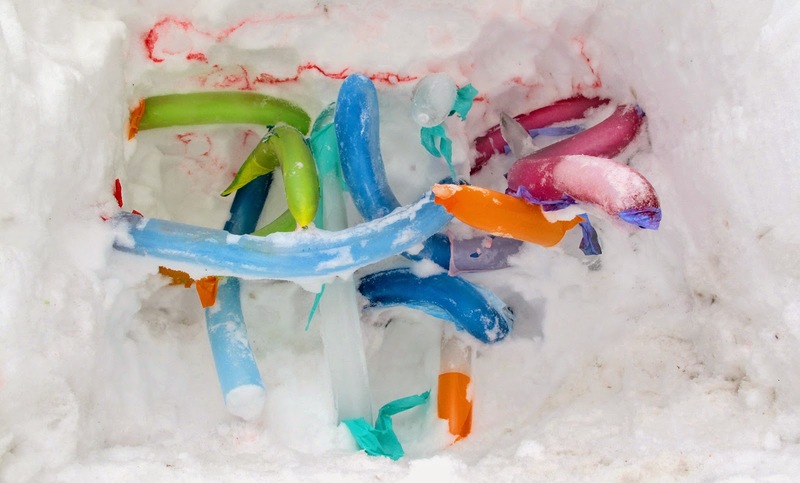 So attempting the practical, I chose to take this ice project to northern Vermont in the dead of winter. It was perfect! The average temperatures in the area were -10 to -15 degrees. What started as a studio project transformed into a site specific performance. I started freezing tinted water in thin tubular colored laytex sleeves, thereby amassing ‘building blocks’ which would in turn be assembled into organic configurations, (my idea of Ice Plants). These forms, the Ice Plants, were photographed to be used as materials in my artistic research. Early in the residency, looking for more organic quality, I moved an Ice Plant outside and buried it deep into an existing snow bank and began injecting water through channels into the burial chamber. 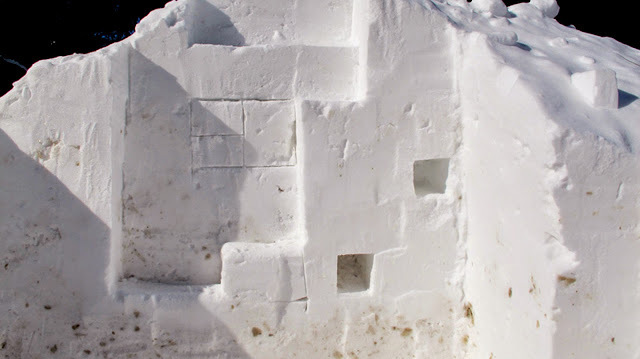 The following day I thought that excavating this piece out of the snow could be more visually revealing if, rather then digging it out as I had buried it from the top, I dug carefully towards it from the face of the snow bank. This method of search became an archeological dig in nature! What progressed over the next two weeks of my residency was a complete transfiguration of the project. From the earlier botanical works, this project has been flirting with science and fiction. Moving outside to stage an archeological ‘dig’, continued that magic. 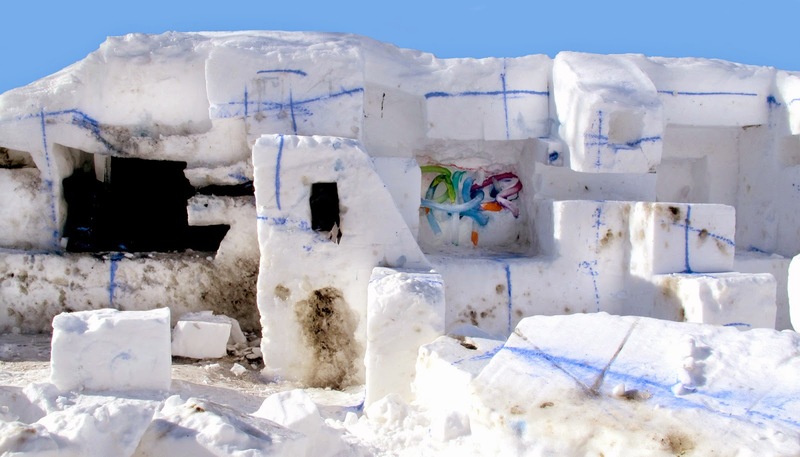 The snow became a white canvas that offered multiple artistic voices. 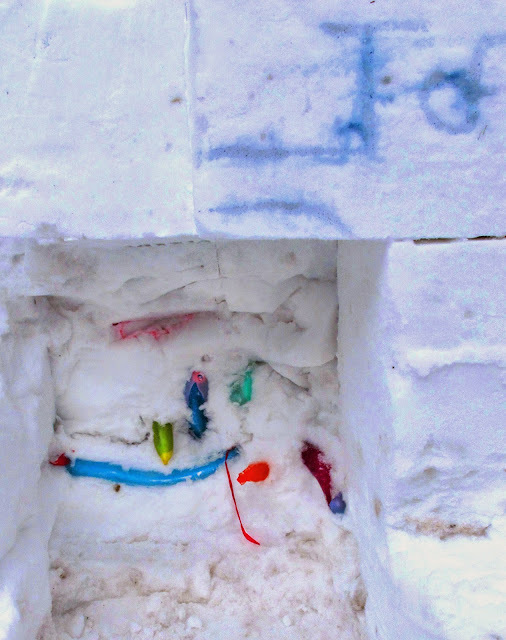 As I proceeded to move down along the snow bank, carving carefully into it’s face I hit on, and exposed Abstraction. Still further down, and deeper in, I discovered the birth of a new Language and several forms of sentence structure!